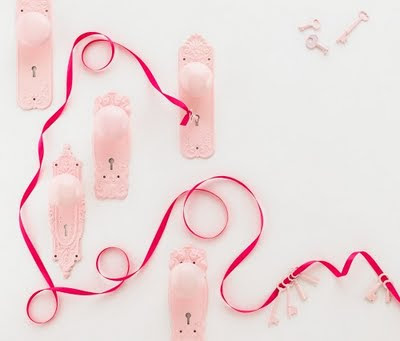 The doorknobs pictured could make a punchy, changeable coat rack and coordinate with a lot of different home styling. Me? Turn them orange. Contemporary? Paint them white. Into shabby chic? Play up the original finish. Practical, and pretty. Lately, a lot of my time has been spent preparing and packing for an upcoming move. Although it's a very minor move in the scheme of things, it has been making a big impact on the way I look at my objects. Sometimes, the best decorations happen to be the most practical (like a beautiful wooden box for laundry quarters) while other times, the most appropriate decor is something you already have at home, but repurposed. For example, I have a collection of vintage Jadeite dishware; perfect for both a tea party, and the dining room wall!